Watermelon is one of the most powerful fruits that we have around us today.despite insinuation of people that watermelon contain only water and sugar, but in essence watermelon is actually classified as a nutrient dense food, a food that provides high amount of Minerals,Vitamins and Antioxidants for low amount of calories. The powerful health benefit of watermelon cover across all activities from our brain all the way into the cells down to our feet. the accurate time to take this fresh and juicy melon is during summer because these are their seasons and they usually have more Minerals,Nutrients and Vitamins. 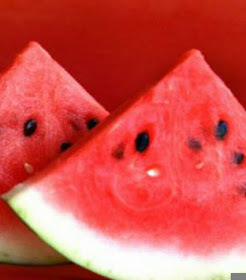 Watermelon is actually full of water up to 90% are water and it has a very low fat. The high presence of vitamin C content in watermelon is a great way of improving our immune system through the presence of redox integrity of cells and also protecting them from reactive oxygen species which can damage our cells. If you are having a wound and you sense is taking like for ever to heal i will recommend watermelon to be taking everyday and you will see fast changes in the healing because of high presence of vitamin C in it. Assuming you are planning for your next workout, if you have a juicer try juicing 1/3 of watermelon .this 1/3 according to a research it contain 1/3 of L-citrulline and amino acid that can protect against muscle pain and also help to relax blood vessels and improve circulation of blood. Almost everybody inclusive myself doesn't like eating of watermelon rind and seeds because is not too good in our mouth, but a recent research had it that blending watermelon rinds with lime is good for our health and not only does the rinds contain plenty of health promoting and blood building chlorophyll it also contain more of Amino acid. So when next you lay your hand on watermelon drink and eat everything i mean everything they are good for your health. If anybody is having challenges in his bedroom especially for Men this fruit works as a natural aphrodisias and a natural viagra when blood circulation is the problem. Watermelon is one of the best dietary source of Lycopene an antioxidant that was linked to both the prevention and treatment of cancer. 5. IT HELPS TO LOWER BLOOD PRESSURE In a recent research it has been discovered that watermelon can reduce ankle blood pressure, brachial blood pressure and carotid wave infections in obese middle age adults.